This page covers advantages and disadvantages of smart home. It mentions smart home advantages or benefits and smart home disadvantages or drawbacks. • A home equipped with smart devices which are controlled using mobile app is known as smart home. Smart home is about creating better home to live. • Smart home technology is also known as home automation. • It offers various features to the home owners such as security, comfort, convenience and energy efficiency. 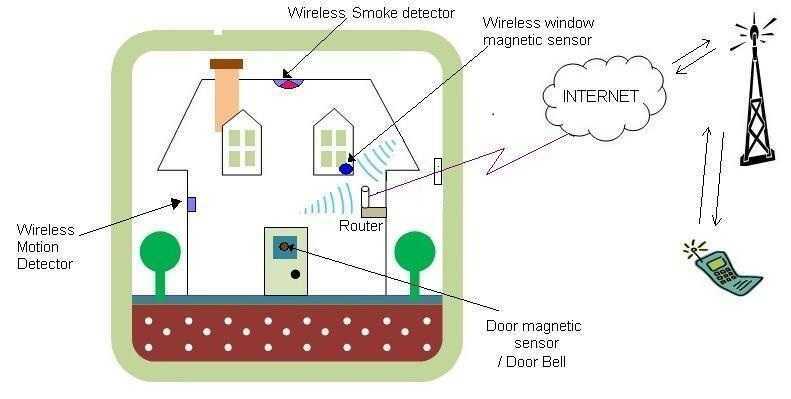 • The figure-1 depicts components of a smart home security system using zigbee technology. • Initially X10 communication protocol was developed for home automation. Later on other technologies such as Insteon, KNX, Lonworks, zigbee, Z-wave have been developed for home automation. • Recently smart home products have been specifically developed by companies such as Google, Amazon and Apple. The products include Google Home, Amazon Echo and Apple Homekit. These products are designed to offer multiple features in single product. Moreover these can be controlled wirelessly using app installed in laptop/mobile/tablet. • Smart home products include smart TVs, smart thermostats, smart locks, garage door openers, smart security cameras, smart coffee makers, smart refrigerators, smart electricity meters, smart water pump system and so on. • With advent of machine learning and Artificial Intelligence (AI), smart home systems are becoming more popular and more advanced. ➨It offers peace of mind to home owners as they can monitor their home remotely which helps them avoid potential dangers of theft as well as accidents. Potential dangers include smart coffee maker which has been left ON by mistake, front door has not been locked and so on. ➨It is beneficial to elder people by providing all care at home. Moreover they can be monitored remotely. This avoids extra expenditure of nursing home. ➨It offers other features to home owners such as automatic opening of garage door, automatic switching ON of lights when owner opens the door, automatic playing of favourite music and so on. ➨The other appliances such as smart airconditioners will make sure to keep your home ready for you with desired temperature when you arrive from office to your smart home. ➨The smart irrigation systems will make sure that water has been provided to the lawn as per need and saves water resources. ➨The smart electicity systems will make sure to switch off lights automatically which helps in energy savings to considerable extent. ➨Smart home systems are complex for common people. It requires training for people having little knowledge on smart home technologies and products. ➨Smart home devices should be interoperable regardless of their respective manufacturers in order to make effective smart home automation system. ➨There is no gold standard developed for home automation yet. However smart home devices and appliances are designed to ensure interoperability and seamless user experience. ➨Security from hackers is a big concern in a smart home automation system. This is because if hackers are able to infiltrate a smart device, they can turn off lights, turn off alarms, unlock the doors, copy secret personal and official data and so on. ➨The other major concern with smart home systems is data privacy. This is due to availability of consumer data with device and platform manufacturers. This necessitates higher trust and transparency between manufacturers and users of smart devices. ➨Also refer advantages and disadvantages of Smart City >> for more information.